Setting Guitar Rig 5 with Studio One V1.6.4. HEY GUYS, THIS IS THE FIFTH TIME I'VE ASK THIS QUESTION. I HAVE YET TO SEE THE QUESTION LISTED. How does Studio One exchange work? 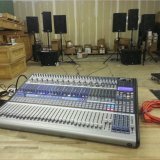 Why does Studio One hangs on Hardware Integration? Is there a Tutorial for Sidechain Compression in Studio One? Setting up your Audio Device with Studio One? Why are my record/mute/monitor buttons no longer visible in Studio One?